Sometimes it feels like I’m the only one struggling to balance the demands of work with the pleasures of leisure. More often than not, work wins, creeping into my mind, occupying my thoughts, even when I am sleeping. And I’m lucky, I love my work. It gives me purpose and satisfaction…and a fair share of frustration. It’s report card time, the time when I most feel the tug threatening my balance. My shoulders start to knot, carrying the unspoken conflicts of the mechanism of reporting student progress. Somehow my students are also feeling the tip too, rocking like those weeble dolls of days gone by, out of sorts and out of focus–just when I need them to be so much more. Walking on the beach on the weekend, I noticed some other people seeking balance. I watched an engineer/artist drag quite a few rocks over to a large algae covered boulder facing the low tide seas–the perfect canvas for this temporary art. With careful precision each rock was placed, with an eye to both balance and beauty. Nearby another person sought to achieve balance of the body. Crouching low and tipping forward, lifting first a toe, testing the raising of each foot until both feet were raised and balance was achieved–if only for a few seconds. Instead of planning assessments for tomorrow, my students will be making wire fish sculptures. Using floral wire and buttons, they will bend and crimp, thread and fold until beauty emerges from one long wire. Ultimately, they will create a mobile, seeking to balance their wire fish on a piece of driftwood with the help of fishing line. I’m pretty sure their efforts to create balance and beauty will create an oasis of balance and beauty for me too. I’ll tackle the report cards later. This entry was posted in clmooc, Slice of Life and tagged assessment, balance, making, mobiles, writing on March 19, 2019 by kd0602. It’s CLMOOC time…in fact it’s the break/brake week, meaning that without specific prompts or even general guidelines, I have been thinking about ways to make and connect. There’s been lots of talk about the postcard project in the CLMOOC community (and by the way, if you haven’t stopped by yet, everyone is invited!) and I’ve been tempted to join the fun to send and receive (through snail mail) postcards to CLMOOC friends. I knew I wanted to incorporate my photography into the process but hadn’t really worked that out yet. And then I saw a post on Teachers Write, a Facebook group focused on getting teachers writing in the summer, where Madelyn Rosenberg offered her version of a quick write called Postcards! Earlier today I broke down and gave into my impulse to try out Prisma, a photo app that turns your photos into art (some of the effects are really cool!). And then I buckled down and tried on Madelyn Rosenberg’s Postcards quick write strategy. With words and an image, I headed over to Canva to combine the words and images. On Sunday my husband and I stopped by the beach around 6:30pm for a pre-sunset walk and I was amazed at how many people were in the water…still. I took a photo from above the beach to try to capture the numbers of people in the water. I think the re-imagined photographs and short form writing work well as postcards, so my next step will be to transform these digital postcards into analog postcards to address and slip into the mail…to surprise…someone! This entry was posted in clmooc, writing and tagged break week, making, photography, postcards, quick write on July 26, 2016 by kd0602. Leap year comes only once every four years, bringing an extra day that evens up the calendar with the rotation of the earth around the sun. With all that rotating and leaping going on, it seems like a perfect month to continue the theme of energize with our photographs too! Out hiking in San Diego’s back country today I noticed this sign advertising the dangers of entering the area…along with the bullet holes evident through the metal! Luckily today was not a fire risk day and the hike was beautiful! On a beach walk I took recently I noticed this surfer with his surfboard carefully balanced on his head. I couldn’t resist snapping a picture…and he smiled when he noticed me. It’s importance to practice balance in lots of ways. I’ve been noticing other photographers “in the field” and have enjoyed photographing the photographer. Watching others with their cameras gives me a way to think about and understand my own processes. I couldn’t quite decide what this guy was focused on. You can see the fisherman in front of him, but I never did confirm his subject–he might have been photographing the waves. I love watching seagulls and capturing their antics through my lens. Many of the photos are static, making this one even more interesting as I caught the seagull wading as the rising surf moved into his space. from playing to meditating (like this guy crafting a meditative mandala maze)–there is something for everyone! So for the not-quite-as-short-as-usual month of February be on the lookout for shots that energize. Look for action both subtle and obvious. Capture the moment of the leap, figuratively or metaphorically. To get you started, here is a list of verbs to remind you of the variety of action and energy you might find as you head out with your camera. As always, our challenge will allow us to learn from each other as we shoot our own photos and study the photos others shoot. The prompts are there to help you find new ways to look at your world, to find the unexpected in the ordinary and the beauty in the mundane. You can use them in order or pick and choose as you like–you are welcome to add a new prompt into the mix if you are so moved. You can post every day, once a week, or even sporadically throughout the month…whatever works in your life. Be sure to share and tag your photos with #sdawpphotovoices so we can find them! You can share on Twitter (follow me @kd0602), on Instagram (@kd0602), in the CLMOOC community on G+, on Flickr, or even link back to my blog here. Energize February with your photos of action, leaps of imagination, and innovative designs. Let February be your muse as you view the world through your lens. This entry was posted in clmooc., photography and tagged action, beach, connected learning, energize, February, hiking, Leap year, making, photo essay, photo-a-day, sdawpphotovoices, writing on January 30, 2016 by kd0602. Some days finding a photo to take and post is a challenge. Most of the photos I take are “found”–meaning that I don’t stage them other than moving around to get a better angle or to change the light. I seldom arrange things or stage a shot. But yesterday was different. First, I was thinking about the idea of re-mediation, a concept being explored in the second make cycle of the CLMOOC. My photo-a-day prompt was shadow…and I had just gotten home from a full day at the Summer Institute. As a break from working on my #beachpeople documentary, I grabbed my camera and headed outside to look for a shadow opportunity. Nothing was grabbing my attention–the shadows I noticed seemed ordinary. 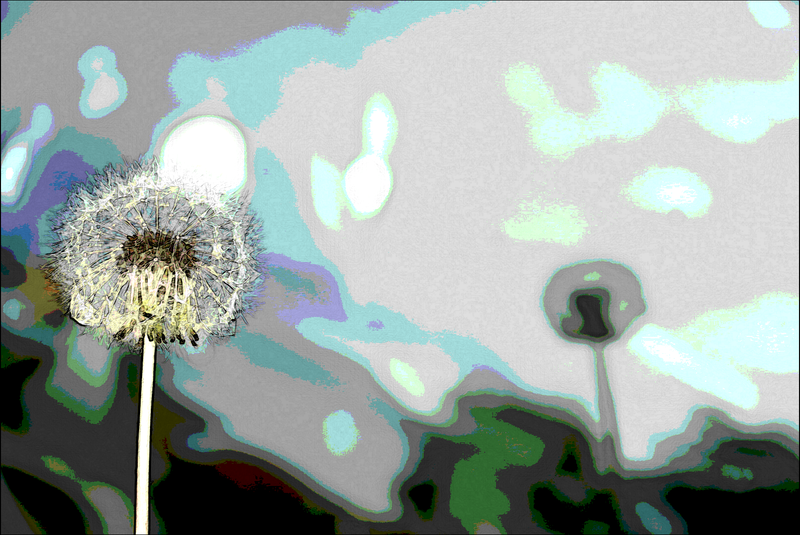 That’s when I decided to pick a dandelion puff. As I looked at it I wondered how I might photograph it in a different way. I thought about blowing on it…but couldn’t figure out how to hold it, blow on it, and photograph it at the same time…and where would I get shadow from that? Instead, I started holding the dandelion out to see how it cast its shadow. I tried the sidewalk, the side of the house, my car mirror, and the shiny paint of my car. I had to work to get the focal length of my lens right so some portion of the shot would be crisp. I took a number of shots. Here’s what I started with–the original, unedited photo. And here’s the art I made as I re-mediated the image. 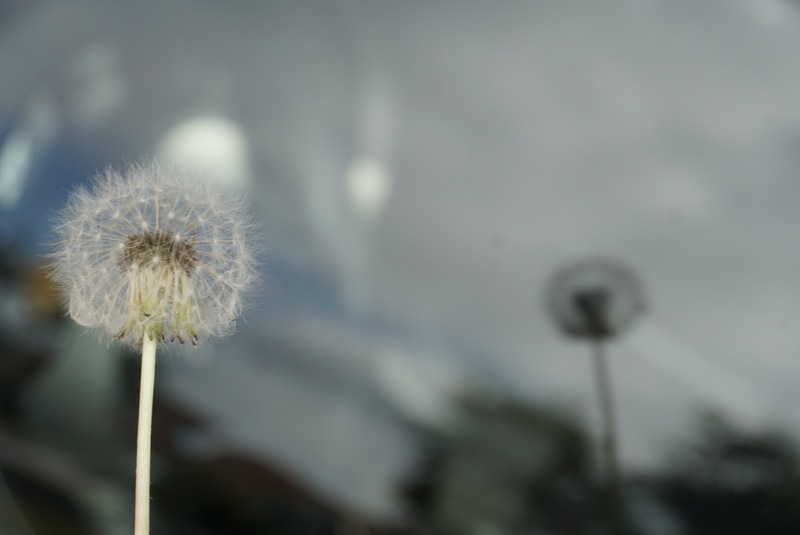 I love the resulting image–the crispness of the near dandelion and the echo from the shadow. I might need to print this one and hang it in my house somewhere! I share my photography and writing on social media. You can find me on Instagram and Twitter using @kd0602. If you share your photos and writing on social media too, please let me know so I can follow and see what you are doing. To help our Weekly Photo community find each other, use the hashtag #makeart for this week and include @nwpianthology in your post. So grab your camera and make some art! You make the rules…and feel free to re-mediate and let your imagination run wild! This entry was posted in clmooc, Weekly Photo Challenge and tagged #beachpeople, art, dandelions, making, nwp ianthology, photo essay, photography, re-mediate, writing on July 3, 2015 by kd0602. As I have worked to grow and stretch with my photography over the last few years, I discovered a genre of photography called street photography. The idea is to document the people and activity on the street. I haven’t studied much, but it seems that this photography comes out of cities…places where activity on the street is common, especially if you are paying attention. This is a harder kind of photography for me, my natural inclination is to pay attention to nature and scenes rather than people and their activity. It’s also about feeling intrusive, taking pictures of people instead of things. I’ve read that many street photographers talk to their subjects and ask permission to take photos of them. And this makes sense to me…but also takes away some of the candid nature of capturing the action in the moment. So, I have been exploring this idea of street photography on my own terms, in my own place. I started to capture interesting moments and interesting people on my beachwalks and hashtagging those photos with #beachpeople. I love the variety of #beachpeople I come across. They are interesting and diverse. Some are obviously tourists visiting from other places–across the county and across the world. And some are natives, the beach is their place. 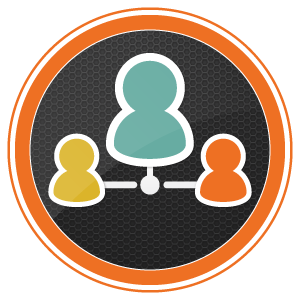 As this week’s make cycle in the CLMOOC comes to an end, I’ve been considering what the idea of re-mediation means for me…and what my make might be. And I started thinking about this collection of #beachpeople images. I decided to I would take these still images and create a documentary-of-sorts. That took some doing. I considered using animoto and just tossing my photos in and letting animoto do the work. But I felt constrained by the 30 second free movie and the lack of editorial control. So I decided on iMovie–I’ve fiddled with it before (here and here)…but that also meant if I didn’t want to use the overly familiar iMovie music, I would have to figure out how to access open source music. I found this track called Folka Dot Tie by Mr Crispy–The Rat Room that created the sort of mood I was looking for and went to work. As the mother of a filmmaker, I know what I want things to look like…but not necessarily how to do those things myself. I did discover some options that I didn’t know about as I positioned the photos and got them to move. And after spending hours getting to this point, I’m going to let this be good enough for now. I hope this re-mediation captures the variety and character of this small subset of #beachpeople, documenting just a few of the many reasons I treasure my beachwalks…and enjoy viewing the world through my lens. 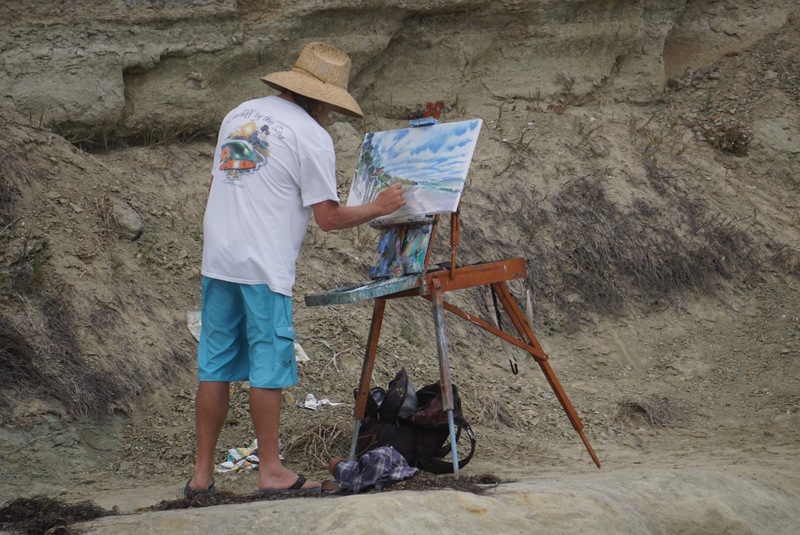 This entry was posted in clmooc, photography and tagged #beachpeople, documentary, making, photography, re-mediation on July 3, 2015 by kd0602. Tonight was Open House at my school, that wonderful evening of celebrating all the learning that has happened all year. The third graders (and their parents and teachers) are feeling a bit melancholy, realizing that the end of three years is in sight and there is change in the air. In addition to spending time chatting with families we currently teach, we also met many of the students who will be our first graders in the fall. Those shy, unfamiliar faces will soon be a part of our learning community. Tonight’s Open House featured MACville–our student created community made up of twelve 32 x 32 inch grids. Each grid was planned by a group of four students working within the constraints of a building code. 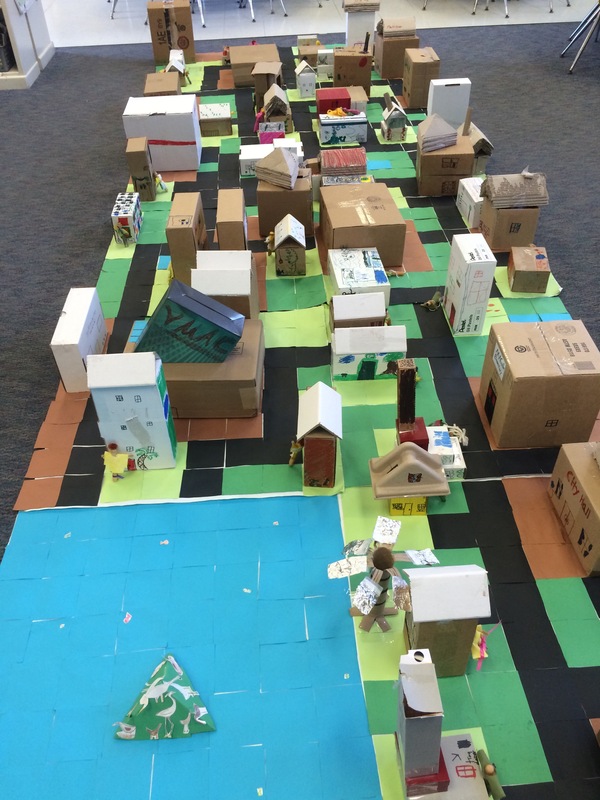 Here’s a peek at our cardboard community. And when I got in my car to head home after a very long day, the sea and sky called to me. The weather forecasters have been predicting rain, but we often get a chance of rain in the forecast that comes to naught. 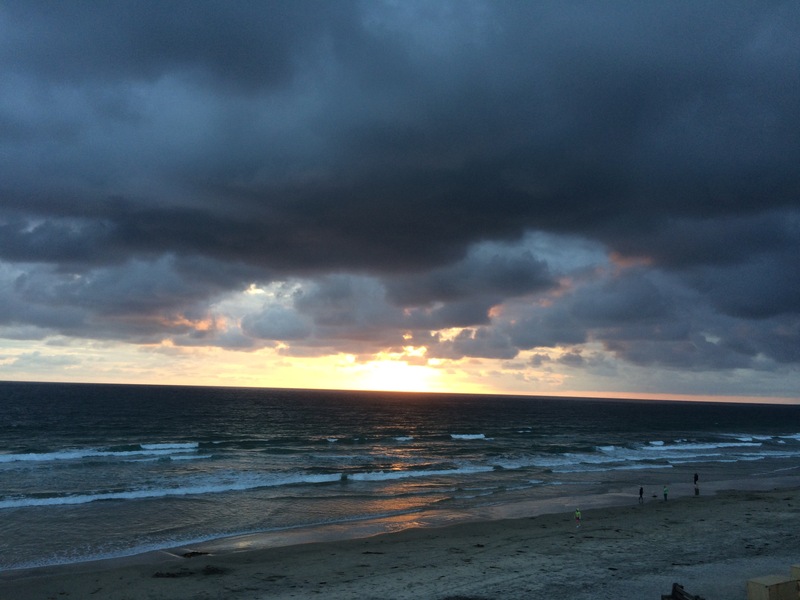 But with the sun setting into the ocean and storm clouds gathering, I headed toward the beach with my phone in my pocket. As the wind whipped my hair and my jacket billowed around me, I snapped shots of the amazing colors of the sky and sea. No editing was needed, the light and clouds and water did all the work. So where is the change in your life right now? In the weather? In your classroom? In your personal life? In your art? I share my photography and writing on social media. You can find me on Instagram and Twitter using @kd0602. If you share your photos and writing on social media too, please let me know so I can follow and see what you are doing. 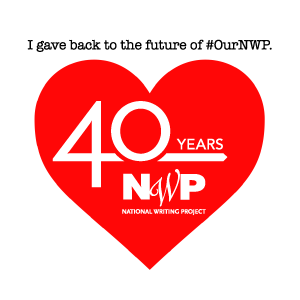 To help our Weekly Photo community find each other, use the hashtag #change for this week and include @nwpianthology in your post. Change is the air for me right now. What change will you capture through your lens? This entry was posted in Weekly Photo Challenge and tagged cardboard, celebration, change, iphoneography, making, nwpianthology, photography, sea, sky, storm, writing on May 21, 2015 by kd0602. Representative government, a staple of our democracy, is something we often learn about in school…and yet seldom engage in beyond voting. But for the last several years, through my interactions with the National Writing Project, I have had the opportunity to push myself to delve more deeply into the governing process as I visit the congressional representatives of our region to advocate for our organization by heading to Capitol Hill in Washington DC. This means making appointments with our congress people, meeting with them to talk about the work we do locally, and often making a request that they sign onto a Dear Colleague letter or support a particular piece of legislation coming up for a vote. And for the last few years, my friend and San Diego Area Writing Project colleague, Abby Robles, has been coming with me, setting up appointments, and helping to build relationships with the representatives and their staffs. There’s something larger than life about this city. Monuments loom large, bringing the history of our country into focus. The streets teem with people…and when you are on Capitol Hill, most are in dark suits rushing here and there. Armed sentries stand at attention and the entryway to all governmental buildings require passage through metal detectors. Like hives, the houses of representatives buzz with groups of people in conversation. Tiny elevators carry people from floor to floor of massive marble hallways, old fashioned clocks beep and wink indicating voting in progress. Impossibly young interns man the phones, handle queries, and usher people in and out for appointments. Each office is decorated with artifacts of “home,” the place the congressperson represents. Last year Abby decided to make a movie about her trip to DC to show her students. So we talked through her plan, scoped out potential shots, and considered how we could use our time in at the Capitol to tell a story. With Abby as the star, I was pressed into service as cinematographer, filming pieces of our visit that she would stitch together into the movie. It was great fun…and the movie was quite a hit! And so this morning, Abby was eager to make a new movie for her students and we began talking as we walked to the Capitol for our meeting. A conversation we have had before is about the word capitol with an “o” and how it is different from the word capital with an “a.” This led us to the discussion of the multiple meanings of words…and what ultimately became the inspiration for the story Abby would create for her students. I was studying carefully today, taking in Abby’s process as we thought about the different movie scenes and planned the shots. I have tiptoed into some movie making…but have only used photos…no video at this point. (Here is a movie I made a year ago) We had lots of fun with word play as we considered the many possibilities for words that had meaning in this place where our government lives. And as we shot each scene, we were thinking about what would come next…knowing that we would ask our representative, Scott Peters, to play a role in the video. And what a great sport he was, not only agreeing to play along, but also adding his own twist to the plot, creating complexity and authenticity. Making the movie kept our day lively, as each place we went became fodder for our thinking about multiple meaning words. And by including the congressman in the movie, our conversation with him became more genuine. We laughed, shared stories about our work and his, and engaged his staff in our video vision. The making made us curious…about words, about this place, about angles and light and sound. And it felt good to find a suitable end piece…and a crazy coda with Abby dancing on the steps of the Supreme Court. Abby pieced the movie together…some during our lunch in the House of Representatives cafeteria…and the rest in the hotel bar as people came together to share the results of their day on the hill. And here it is! A lovely movie that reflects Abby’s thinking and her hard work…and I can’t wait to share it with my students too! I think I’m ready to try a movie of my own. I don’t think I will be starring in it…I don’t see myself as quite the actress that Abby is. But I’m ready to try my hand at thinking through scenes, planning shots, and creating a story through the process. Wish me luck! This entry was posted in making, Slice of Life and tagged advocacy, government, making, movies, National Writing Project on March 26, 2015 by kd0602.